Disclaimer: Our “don’t do anything evil” policy applies. Talking about DMCA takedowns and circumventing them doesn’t imply that we endorse downloading anything copyrighted without permission. Always obey the law in your jurisdiction. With more and more newsreaders including multi-server support, the use of backup servers has become more and more widespread in the Usenet community. Sometimes it happens that your main Usenet provider is missing some parts of your download, maybe due to a technical problem or a DMCA request, and in this case most newsreaders can be setup to automatically switch to a backup server to look if the files are available there. The cost of this is rather low. Basically you just need a cheap block account (“buy a 5 GB pack and it will never expire until the volume is used”); in most cases only a fraction of your downloads will go through the secondary server, this might even applies for DMCA related problems. For example Blocknews.net offers 5 GB for $2.75 with an acceptable retention. 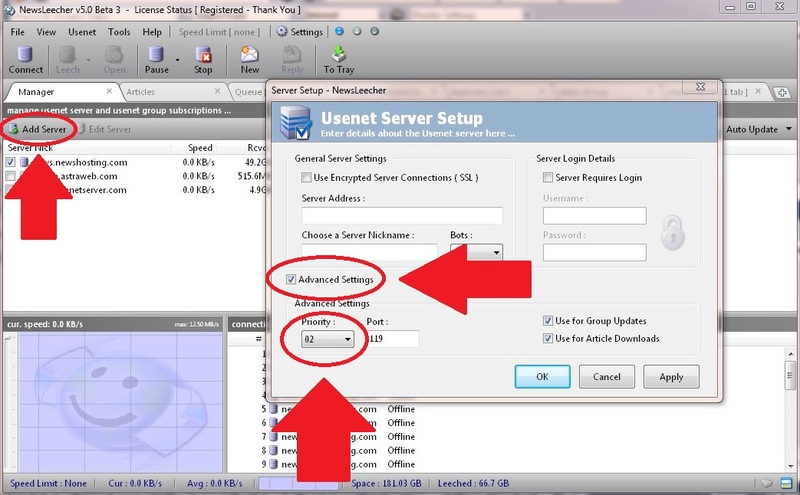 Next, check if your newsreader has multi-server support, if you can setup more than one server chances are you can use this method. 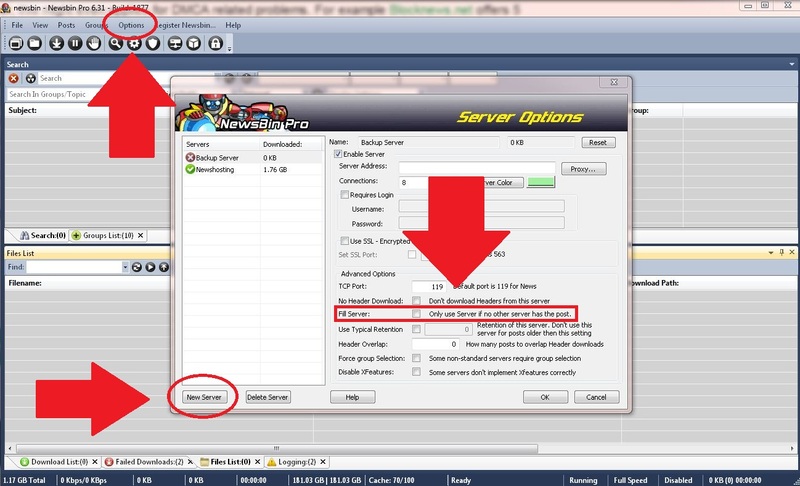 Depending on the program there may be a checkbox saying “backup server” (e.g. SABnzbd+), “fill server” (e.g. Newsbin) or similar, others use a prioritization system where you have to give the backup server a priority lower than the primary one (e.g. Newsleecher) and so on. Check the list below for setup instructions for your newsreader. 1. Go to the Manager tab. 3. Enter the server details. 4. Check the “Advanced Settings” box. 5. Change the “Priority” to 2. 7. Check the box left to the server to activate it. 1. Click “Options” on the top of the window, and select “Servers”. 3. 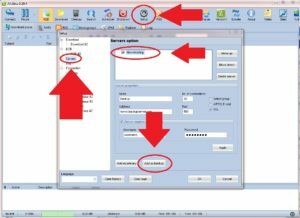 Enter a name to identify the server and click OK.
4. Enter the server details. 5. Check the “Fill Server” option. 1. Log into the web interface. 2. Click “Config” – “Servers” – “Add new server”. 3. Fill in the server details. 4. 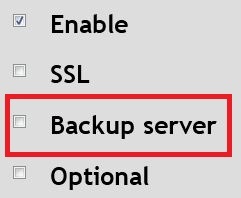 Check the “Backup Server” option (“Fill Server” in older versions). 5. Click “Add server”. Done! Unfortunately Grabit doesn’t support backup servers, even though there is multi-server support. 4. Click on the primary server you want to add a backup server to.